Roll over and click on the yellow buttons below for images and descriptions. 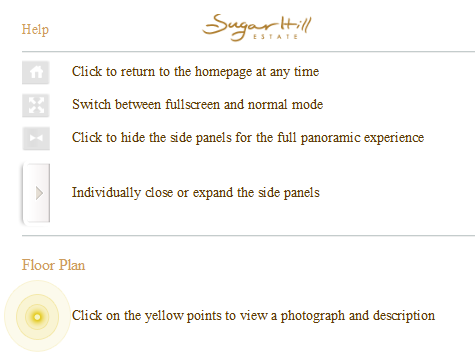 Use the menu below to select your desired plan. The romantic aura surrounding Calliaqua is perhaps most evident on the downstairs terrace. The terrace boasts a stunning coral stone dining table under a crystal chandelier, ideal for dinner parties and memorable evenings. Enjoy delicious cuisine while listening to the sweet sounds of your favorite music wafting through the outdoor speakers while reveling in the sights and scents of Lady of the Night, mango, lime, calabash, banana plants and other tropical foliage. Walking into this bedroom is like stepping in to a secret garden. Varying shades of green captivate your imagination from the cushions atop the king sized bed to the patterned green drapes framing the French door. Affectionately referred to as ‘the parrot room’, this room features prints of these colourful birds. The en suite bathroom with shower can also be accessed when the bedroom door is closed and used as a powder room by day. The romantic aura surrounding Calliaqua is perhaps most evident on the downstairs terrace. Escape for the evening and relax on the arrangement of wicker sofas while watching a breathtaking Barbadian sunset. Listen to your favorite music wafting through the outdoor speakers while reveling in the sights and scents of Lady of the Night, mango, lime, calabash, banana plants and other tropical foliage. The coral stone walls of the living room are adorned with stunning Susan Mains art and are complemented by the earth tones of the furniture. Distinctive accent pieces including large, copper lamps and potted bamboo are delightful additions to the décor. Several couches and chairs dressed with plush cushions sit atop a patterned rug. A smaller, cozy seating area partially separated by a vintage copper divider offers a great spot to relax and watch the TV. French doors open on to a covered terrace facing the poolside. The ornate drapes and high ceilings of the entrance foyer invite you in to Calliaqua. Beautiful hand painted pieces and colourful tropical flowers from the garden set a striking tone. The expansive, upstairs terrace offers unrivalled views of Barbados’ West Coast. On any given day, one can see the cruise liners as they make their passage across the water or get lost watching the water as it deepens from turquoise to navy blue. This space has been aptly furnished with oversized rattan lounge chairs with footstools that almost compel you to sit and enjoy the view! There is a breakfast table that seats four for those early risers. The second guest bedroom epitomizes serenity. The all white theme is refreshing; reminiscent of lazy days on the seashore. The beach house atmosphere is accentuated by the presence of fresh flowers on the dresser and potted plants around the room. The urge to sleep in is impossible to refuse on the luxurious king size bed fitted with white linens and soft cushions. with all of the bedrooms upstairs, French doors open on to the shared verandah and the room features an en suite bathroom with shower. Upstairs, the colourful blue décor of the first guest bedroom captures the imagination. Each of the two twin beds is dressed with a playful patchwork quilt and eye-catching, abstract artwork adorns the walls. Light drapes frame the French doors that lead on to the shared upstairs terrace, providing an excellent source of cool breeze and natural light. A pale wood wardrobe stands in a corner and, additionally, the room features an en suite bathroom with shower and a large, walk-in closet. Upstairs, the Master Bedroom exudes elegance. The vintage-inspired, four post bed is tastefully adorned with a floral patterned bedspread, complemented by cushions in shades of deep red, burnt orange and gold. The king-sized bed is strategically placed to capture the outstanding blue sea views offered by the French doors leading onto the upstairs terrace. On either side sit two polished, wooden bedside tables decorated with large, distinctive lamps. The cottage door leads directly on to the expansive pool deck. This is arguably the focal point of Calliaqua. Soak up the sun’s rays on one of the sun loungers or lie in the shade of a poolside umbrella while listening to your favourite songs through the discreet speaker configuration. Flanked by plants and beautiful flowers, Calliaqua’s self-contained cottage faces the poolside and offers a great view of the lagoon-like pool and the impressive façade of the main property. Stepping inside, the double size bed is fitted with a colorfully printed bed spread and there is a vintage wardrobe in one corner. The cottage features a kitchenette and en suite bathroom with shower. From the terrace, steps lead on to the expansive pool deck. This is arguably the focal point of Calliaqua. Encircled by hibiscus plants and tropical foliage, the exquisite 1000 sq. ft. pool creates the perfect backdrop for your island adventure. Intriguingly designed as several interlocking circles, the pool features an elaborate rock formation with waterfall. Soak up the sun’s rays on one of the sun loungers or lie in the shade of a poolside umbrella while listening to your favourite songs through the discreet speaker configuration. A fully equipped dining gazebo offers a bar with fridge and informal seating for your breakfast al fresco. Out here, relaxation is your highest priority. The expansive pool deck is arguably the focal point of Calliaqua. Encircled by hibiscus plants and tropical foliage, the exquisite 1000 sq. ft. pool creates the perfect backdrop for your island adventure. Intriguingly designed as several interlocking circles, the pool features an elaborate rock formation with waterfall.